New York Times bestselling author Phillip Margolin returns with a shocking and enthralling thriller about the way CSI evidence can be misused by a killer with his own twisted sense of justice. Doug Weaver is a defense attorney who always believes the best of his clients, and Jacob Cohen, on trial for murder, is no exception. Jacob may be homeless and mentally ill, but Doug can't imagine that this meek and intensely religious man could have killed and dismembered a woman. Yet Bernard Cashman, a forensic expert at the Oregon State Crime Lab, finds evidence that indisputably connects Cohen with the crime. Frustrated and confused, Doug consults Amanda Jaffe, star of Margolin's spine-tingler Wild Justice. Amanda and her father, Frank, are working on a case that seems completely unrelated—gangster Art Prochaska is accused of murdering an informer. When Amanda starts looking too closely at the seemingly air-tight evidence in these two apparently unconnected cases, people start to die—and she discovers that a madman with the power to alter the truth is on the loose. 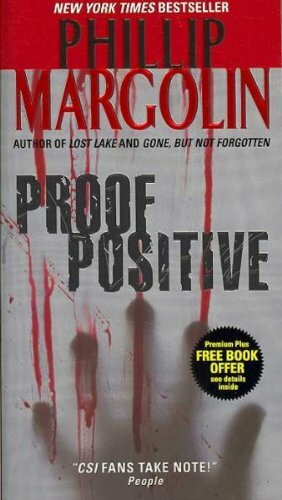 From the author whose writing the Chicago Tribune called "twisted and brilliant" and hailed by Lisa Scottoline as "genuinely surprising," Proof Positive promises an unbeatable combination of inside-CSI detail and intriguing insights into the minds of criminals and the attorneys who defend them—and, of course, the plot twists, stay-up-all-night suspense, and gasp-inducing surprises that are Phillip Margolin's undisputed trademark.